Monday evening, I'm sitting at the computer and all is well with the world. It's quiet in the house. The only sounds are the computer game I'm playing and the voices of my friends through the voice chat we use to communicate when we play. I turned to the right to go put the kettle on for tea and this was what I saw. Mija is the brown blob in the right corner of the recliner. Are they getting along? I would say, six months into life with kitten, 90% of the time, yes, yes they are. We had occasional moments of cooperation in the fall. 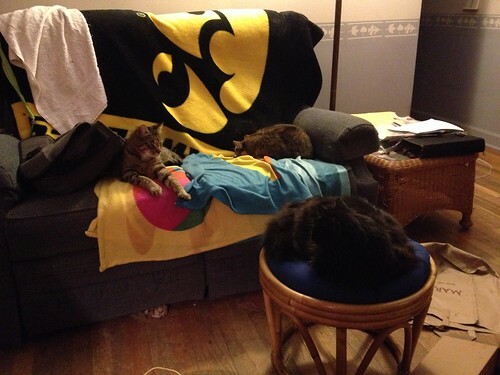 This was taken when I was streaming an Iowa Hawkeyes game on the computer. The girls know I tend to get "excited". Hamlet thought something horrible had happened and took off for the back part of the house. It helped there were clean clothes lacking cat hair dumped on the bed. 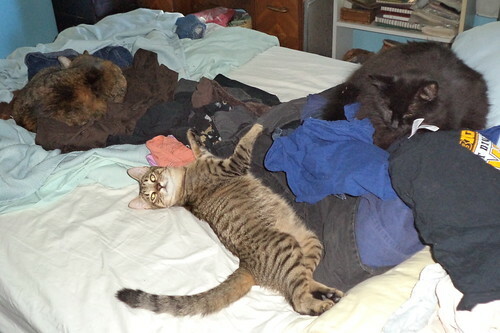 Clean clothes seem to facilitate sleeping together. Here, I had decided to sort my tee shirts, to pack away ones I no longer wear. I know I should think about giving them away, but I have this great pattern for a quilt which uses the whole shirt and, well, I can't quite make the break to adding them to the give away bags. I was in the process of putting shirts back in the closet and got distracted by another task, so the last bit was left. I think I was doing laundry at the same time. 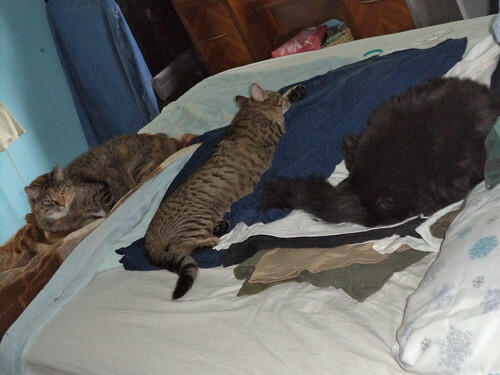 I came back in the bedroom an hour later and here they are. I do think Hamlet has helped the girls lose that last bit of weight the vet wanted them to lose. He chases both of them, although Pilchard has jumped into the chasing and wrestling bit more willingly than Mija. I worried when I adopted Hamlet, that I'd spend years yelling, "Knock it off!" and separating angry cats. It's gone better than I expected and I am so very happy about that.